Please report any new bugs via the issue tracker. Please include the firmware version in your bug report. You can find known (and partly obsolete) bugs here. 2) Make sure you are running Canon firmware 1.1.6. In video mode menu ML turns off quickly. In photo mode menu is not turned off by yourself, just by pressing a button. These are the first impressions. Thanks! I think the menu problem is this one. I'm still trying to find a solution to that. It affects the 70D and 6D 1.1.3 as well. For those willing to test 1.1.6, here's a nightly-like .zip: download. Please report the results of your testing in this thread. Thanks in advance! As for ML itself, using those builds is at your own risk. I use those (and more unstable/testing ones) on a daily basis, but not for important work. You can always start your camera without ML by keeping SET pressed while turning it on. This also comes in handy dealing with April's fool jokes. If you experience any strange behaviour like freezing, crashes, stuff turning weird, the best way usually is to take the battery out and put it back in. Here's the pull request. See also Canon 6D for general discussion. I can help you in testing. I have 70D + 6D. I mostly use them for video. H.264+ some times RAW. That would be great! Just grab the latest .zip from the first post, try whatever you like and post your experiences. Please also report success or anything different to v1.1.3 that could be a bug in ML for v1.1.6. I pulled from the nightly build link today (2:44pm EDT). The install ran without a hitch, while I was on the AC Adapter. I can navigate the menu (saw the timeout you all mentioned). Since focus peaking is my personal favorite feature, I went straight for that. I also remember someone saying that Global Draw had to be On, which it was already. After turning on Focus Peaking, I see no indication of it in Live View. I have tried out a number of settings, but see no effect at all. Is there another setting I should also be checking? UPDATE: I looked in the forums and found http://www.magiclantern.fm/forum/index.php?topic=4081.msg22513#msg22513 which talks about pressing the Info button a few times to change the overlays, and voila - there is a mode in which FP IS working after all. I don't know if it was mentioned elsewhere, but the menu timeout only happens when you press the 'trash-can' button with LV on; if its off, the timeout is either absent or much longer. For the moment, it's works like a charmed. I use ML for Intervalometer, focus stacking, rack focus and audio remote shot. I have a factory firmware with a Factory Menu but I'm not able to change it. If you want some info from this firmware tell me. Imho it's time to push this to the main repo, get it merged and do nightly 1.1.6 builds before 1.1.7 is released :-p. If nobody complains, I'd even vote to dump 1.1.3 unless major problems with batteries being blacklisted by Canon pop up. I guess most people will want to run the most recent fw and downgrading just to make ML work preventing some to try it. Ugh? So this firmware of yours works with the 1.1.6 ML port, but contains this additional "Factory" menu? What does it contain, and what does "not able to change it" mean exactly? Before I have a 1.1.3 but with an another name ... Now I have updated to the 1.1.6 provided on the official Canon website support. I bought this camera with this factory firmware but I didn't pay attention it was in my camera. Just one day, I push the Menu button, I move to another menu, quit the menu and then push menu again and the menu was back on this screen I show you before (blue one with factory menu). Hello. Big thanks to developers who made this software. Just updated from 1.1.3 to 1.1.6, and installed fresh ML. Atm everything works fine, tracking focus starts with center point and holds objects. Sometimes there is a need to switch from Tracking focus to Single, and temporary switch between two can be set to hotkey. I'd appreciate a feature that also switches focus points from Auto when Tracking focus is active to Center Point, when OneShot focus occurs. Or make independent FP choice as it is done in vertical/horizontal orientation..
Can it be implemented in ML? Thank you Maqs! I just upgraded to 1.1.6 and installed this and I will report any issues I run across. Thanks ! I would love to see the focus patterns feature. I guess there's no end to potential little helper functions and features (button-feature mapping and simple if-then). It's clear that for every feature desired by one user ten more will pop up deeming it unnecessary and are against merging. Thus problem is how to integrate 'em all in a general way into ML: it's either via a big usability module with a huge workload on the gui interface or with user scripting. At least with the latter there seems to be hope again looking at the lua branch. If there's a good api to the ml features, you might be able to write most simple automatizations yourself w/o coding C.
Note that in this context it isn't well placed in a 6d thread anymore. I have just installed 1.1.6 FW and updated ML. 2. during secon try i ocassionally pressed any buttons to keep the display on; benchmark finished but no BENCH0.something file was saved. I just bought my 6d and it came with 1.1.6, I need magic lantern for video can I degrade to firmware 1.1.3? If you want to use the nightly build for 1.1.3, just download it, it contains a 1.1.3 firmware update file. To downgrade to firmware 1.1.3, just use the firmware update which is in the download. 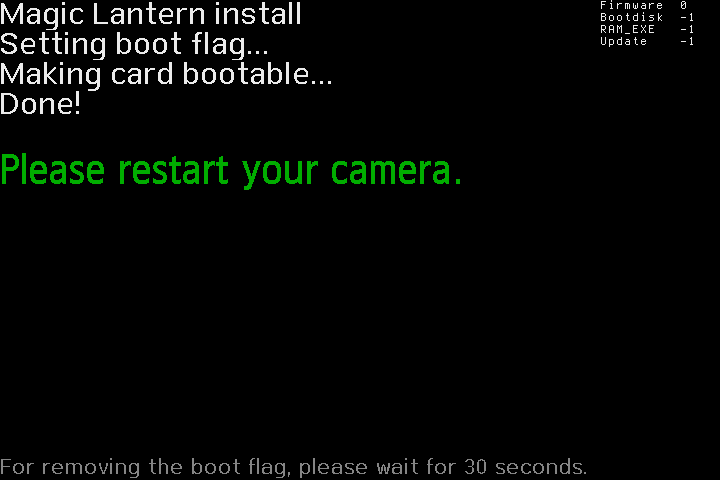 One thing I was not clear on after reading the docs -- if I want to pull down the latest nightly build of 6D 1.1.6 and put it on the card (which already has a prior build), do I need to re-run the firmware update? Or is putting it on the card enough? Delete Autoexec.bin and ML directory from card. Extract files for 1.1.6 and copy contents to card. Startup cam. Thanks Walter. There were no problems; after re-applying some ML settings, I'm back up and running.